I like new parts and colors more than a kick to the junk but why does Lego keep throwing licencing money at stuff like this. They’re barely going to put a single series of this stuff on the shelf then they’re going to abandon it. There are proven and incredibly popular themes that TLG could buy into, stuff that is carrying Mega Blocks into a superior market position as a competitor. I support the new elements! Actually I like the parts and the colors. And licensing is not always a bad idea… it was in the case of Ben10, but this one could actually work. I never heard of the franchise, but I had never heard of The Lone Ranger, Ben10 or Speed Racer either, so that’s just me. Pay no attention to the license… new parts! Awesome new parts! On one hand these new parts are exciting, but on the other hand these sets will likely cost too much because of the licensing. 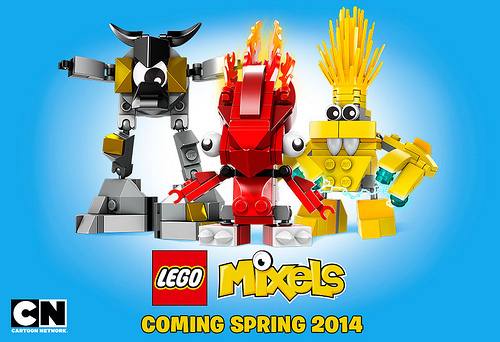 @creative anarchy: Lol megabloks doesn’t stand a chance. New joints? As a constraction builder, I’m overjoyed, ESPECIALLY with the new ‘eye’ printed balljoint! All you people bashing on new elements; what is your problem? If the elements are actually added for function and not some useless one-time-use thing (*COUGH*COUGH*MINIFIGURES*COUGH*) then the new parts are only a good thing? Imagine all the brick-built figures (miniland scale, etc) that people can make now! Personally I’m excited to see what people like legohaulic, moodswim, mortal swordsman, and other people that make brick-built articulate figures will do with the new joints! I bet the hardsuit builders are gonna love those new joints. Also yay for printed eye parts and 1×2 curved wedge thingys! And I have no idea what a Mixel is. Aw, they’re nice. Brilliant new parts, too. Are these based on a cartoon, then? Totally looking forward to those small ball joints! This does not appear to be a license, but an original LEGO theme. If you look on the Lego.com placeholder page it says the trademark is owned by LEGO. 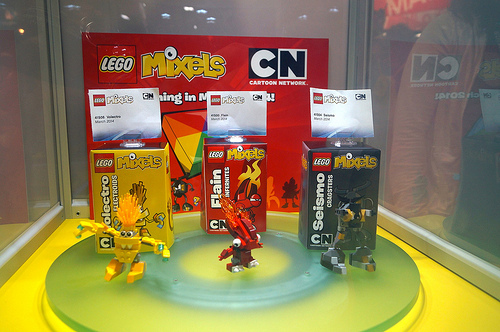 I doubt they’d get rid of or drastically alter the minifig. It’s been around for nearly 40 years and many pretenders to the throne have come and gone in that time leaving only the little guys we all know and love.